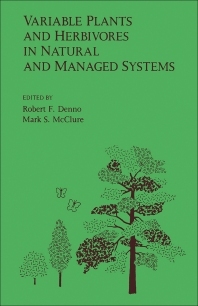 Variable Plants and Herbivores in Natural and Managed Systems examines individual, population, species, and community responses of herbivores to plant variation, with emphasis on insects, fungi, bacteria, and viruses. It is divided into five parts encompassing 18 chapters that discuss variability as a mechanism of defense used by plants against their parasites and the effects of variability on herbivores at several different levels of complexity. After a brief discussion on plant-herbivore interactions, the first part of this book considers sources of within-plant variation and effects on the distribution and abundance of herbivores. Part II examines interplant variation, the co-evolutionary problems it poses for herbivores, and the ecological and evolutionary responses of these animals. It discusses the effects of host-plant variability on the fitness of sedentary herbivorous insects. Part III discusses the role of host variability in the evolution of feeding specialization, genetic differentiation, and race formation. The importance of host variation to the organization of herbivore communities and the manipulation of host-plant variability for the management of herbivore pest populations are presented in the remaining parts. III. How Does Colonizing Ability Vary with Density? IV Communities at Equilibrium or Nonequilibrium?